Your Daily Apple for Summer: Grill It or Chill It! YAKIMA, WA. 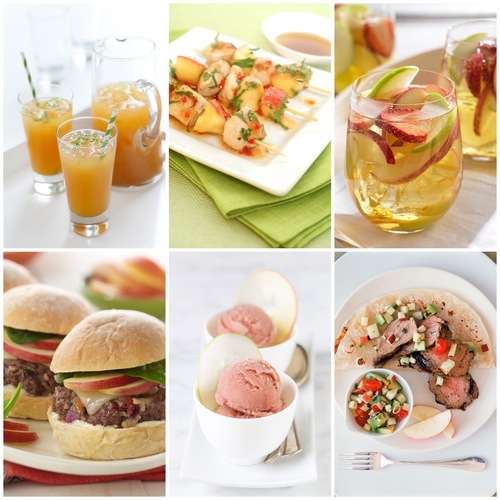 – June 1, 2015 – Whether for good health or just for the halibut, apples are the ideal ingredient to mix up your favorite summer fare (think skewered apples and halibut kabobs). From Galas over the grill to Braeburns by the beach, Borton & Sons, Inc. is offering six recipes to grill or chill your daily dose of apples this summer. “This season, whether you and your friends prefer grilling or chilling, apples make the ideal companion for all summer adventures,” Ehlis added. Chill It with Apple Sangria: When the temps start to go up, cool down with a refreshing pairing of apple slices, apple brandy, strawberries and grapes. Best served with a seat by the pool! Grill It with Apple Salsa-Topped Pork Fajitas: Make an unforgettable Taco Tuesday courtesy shredded pork off the grill, made better by topping with a tasty salsa mix of apples, cilantro, jalapenos, cherry tomatoes and more. Chill It with Cider-Pomegranate Sorbet: Your prescription for a 98-degree afternoon: Two scoops of this easy-to-make, superfood-packed sorbet. Grill It with Apple Halibut Kabobs: Skewer up a delectable combo of apples, onions, red pepper and this perfect-for-the-grill fish. Chill It with Apple Ginger Chillers: Chill responsibly with a cool combination of 100% apple juice, non-alcoholic ginger beer and vanilla syrup. Want to keep up with the latest on apple health and recipe ideas this summer and throughout the year? Follow https://www.facebook.com/BortonSonsInc?ref or www.USAppleBlog.org for the latest. Media: For more information or high resolution images, contact Lindsay@bortonfruit.com or (509) 823-2727.